Although I might be better off preparing other stuff, I am currently totally fixated on finishing my smaller, older WIPs from my List für Q3. So after getting back on Sunday from a choir competition I basted and quilted the first baby quilt from the two drunkards path. I really like your drunkard’s path. It’s got such a wide range of colors but it still feels very balanced. Can I ask where you got your tags with your name and washing / care instructions? I designed my labels myself in a graphic program and had them printed on cotton fabric by the German company Stoff-Schmiede. The company is like spoonflower. I just iron them on (double sided adhesive/ vlies) and sew around with a zig zag stich for good meassure. Oh, I’m so glad you’ve pulled this back out… it will make for a lot of nice catching up at our next get together. Crossing my fingers for your weekend finish! 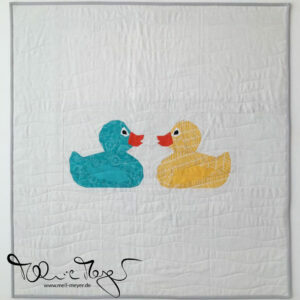 I love your baby quilt! 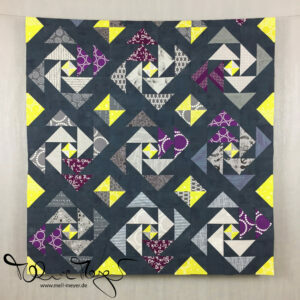 The scrappy Drunkard’s Path blocks make an awesome quilt! 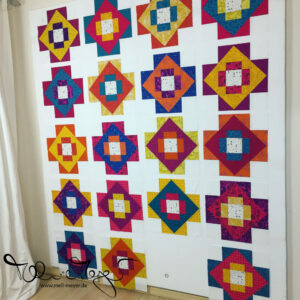 A lovely scrappy quilt… Drunkard’s Path has always been a favourite of mine!